They say you can tell someone's age by simply looking at their hands, yet they're something so many of us forget to take care of. Since we use them so much each day, they can quickly become dry and sore - especially this time of year. Similarly to skincare, there are many different stages you can choose to undertake to keep them under tip-top condition, such as oil and cuticle erasers. However, hand cream is definitely the first key stage in making them look great. 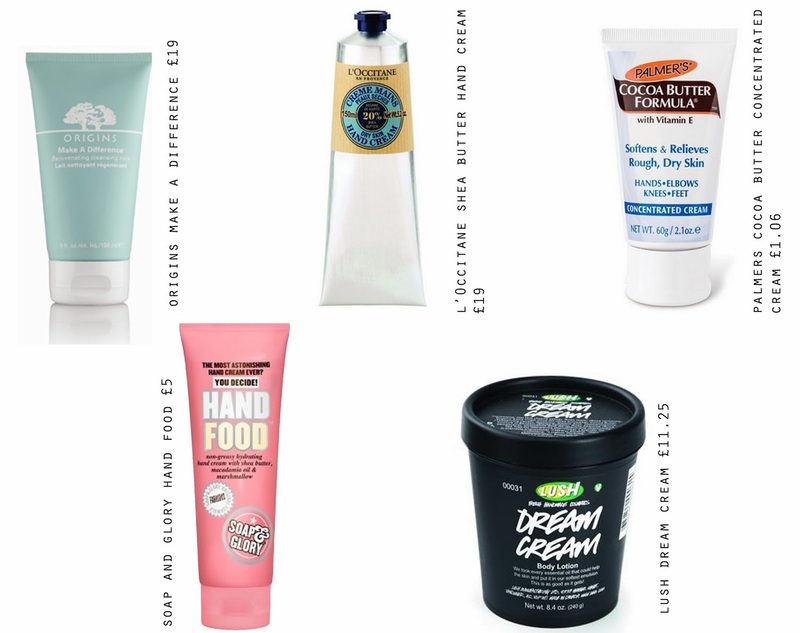 I've tried many different hand creams over the years, and from doing so, I've learnt that you don't necessarily have to spend a load to achieve great results. One of my personal favourites is Soap & Glory's offering. With it's bold packaging and sweet fragrance, Hand Food is evidently girly. It's not-too-thick-not-too-thin consistency soaks into the skin like a dream, leaving the hands feeling soft and hydrated. And at only £5, it's a real bargain. Palmer's Cocoa Butter Concentrated Cream is another that doesn't tug on the purse strings. At a mere £1.06, you'd be right not to expect too much from it. But boy, does it deliver. I find this to be a good'n to apply just before you hit the sack, due to it's intense scent and richness. If you do fancy taking this out with you on your adventures, however, it's the perfect size to just throw in your bag. If you're looking for something which can offer you a little more, then Lush's Dream Cream is something you definitely need to get involved in. It's multitasking properties mean you don't just have to stick to using it for your hands. Oh no, this bad boy is suitable for the body, too. I've also heard people say they use this on their face, but I think for me I would find doing so a little too harsh, so I can't comment on the results. A great soothing, winter moisturiser which is supposedly great for eczema-prone skin. £11.25 will get you a mahoosive pot of the stuff. The hand cream I've most recently added to my stash, is the Origins Make a Difference Rejuvenating Hand Treatment. Out of the five I've covered, this stuff definitely gives the quickest results. As soon as you apply this, your hands will certainly be thanking you. Although it's of more expensive hand creams (this will set you back £19) it's definitely worth parting with the cash for, thanks to it's brilliant results. And like all Origins products, there's no need to worry about any nasties hidden within the ingredients - there are non. The question is, will I ever find a product from the brand I dislike? The L'Occitane Shea Butter Hand Cream is something I have been purchasing for many years now. My Mum is a huge fan of the stuff (understatement) so I guess I can thank her for my mild obsession. Like the Origins offering, this is priced at £19 (although it's worth mentioning that you can get smaller/cheaper sizes of both) so it certainly ain't cheap, but this stuff is seriously good. Apply a load before bed and you'll wake up with the softest hands you've ever laid your eyes on. I also happen to absolutely love the smell of Shea Butter, so I would quite happily apply this all day long, although thinking about it, that would be quite an expensive habit to obtain.. In case you were wondering, this is my favourite of the bunch. I love the L'Occitane hand cream, it is SO amazing!